Can the Epi Scopal Church speak of the love of God? - What is in Kelvin's Head? You are here: Home / Uncategorized / Can the Epi Scopal Church speak of the love of God? Can the Epi Scopal Church speak of the love of God? Identity matters. It always has of course but these days it seems to matter a huge amount. And one of the most difficult things for Scottish Episcopalians is to explain to others who we are. The name doesn’t help of course. Scottish Episcopal always sounds a bit more like an Edinburgh based insurance company than a part of the church universal. And the simple truth is that a lot of people have never heard of us, or if they’ve heard of us have no real idea who we are. Tricky names make things difficult. My name is one that lots of people get wrong. One of the great advantages for me in living so close to Glasgow’s greatest, if not widest river is that I live within the only few square miles of the world where I seldom have to spell my name to people. This came home to me once when I was gearing myself up to do a national broadcast on the BBC. And I could hear the continuity announcer in the headphones I was wearing introducing me live on air as the Very Rev Kevin Holdsworth. I sighed deeply just before the red light went on ready for me to be bright and perky to the nation. And I heard him finish his sentence with, “… the Very Rev Kevin Holdsworth, from St Mary’s Epi-Scopal Cathedral in Glasgow”. The Epi-Scopal sounds more like a procedure that you would have done at Gartnavel than an identity that you would want to be known by. The truth is, we’ve not been doing terribly well as a church with getting people to know who we are. 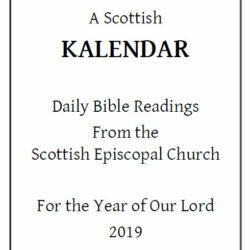 My view is that this is one of the biggest jobs that the Scottish Episcopal Church has on its hands at the moment. No-one is going to learn anything about the love of God from us if they think we are an insurance company or a ghastly piece of medical equipment that goes up your nose, down your throat or …. No, let’s not think about where else an Epi Scopal might go. But it is a job that can be done. We can reclaim our space in the public life and consciousness though probably not by being meek and mild. This week I found myself being asked to talk to dozens of young LGBT activists who were gathered in Edinburgh for a conference. I was asked to join a human library. The idea being that the young people could come and speak to all the exhibits and hear our stories and ask us question. I know of no process more clearly designed to make you feel ancient. But the young people treated us all like national treasures and had good questions. And they all wanted to know what church I came from. And I tried to explain. Are you a Reformed Church? Yes. It was a little puzzling for them. Until they started asking questions that were a bit like the questions that were being put to Jesus in the gospel this morning. Then we started getting somewhere. Well, what do you think about marriage? Who can be married? What do you think about divorce? What does your church teach? And I found that my identity was being seen through the lens of what they thought were decent ethics. And I don’t really have a problem with that. I think our ethics – the way we behave are our calling cards. People will remember us by the way we behave at least as much as by what we say. I find it interesting that religious groups in Jesus’s day found their identities in what their leaders taught about marriage. And I find it interesting that Jesus is sitting down with his disciples and giving his take on marriage and talking about how it is changing. Marriage was political then as it is now. Jesus is in the part of the world where John the Baptist had his head cut off for challenging Herod’s marital behaviour. His answers to the questions here are not just about what the man or woman on the Jerusalem omnibus is to think about marriage and divorce but had political overtones. Jesus is using language which might put him at risk from harm – which may be why some of his teaching about it seems to be done in private with just the disciples. As I was preparing this sermon, I saw others on social media having trouble trying to work out what to say about it. Mark 10 is a difficult chapter for many to preach on. I think that it is no problem at all if we are prepared to accept and preach boldly and with confidence the truth, which is that the body of Christ today teaches things differently about marriage than the person of Jesus did when gathered in private with his disciples. We don’t believe that someone who is divorced is committing adultery when they remarry. That was one of the questions the young activists asked me this week. We believe and teach something different to Jesus in his name because we believe in our day that the love of God commands us to have compassion. We live in a place and time where we teach that God’s love compels us to recognise that sometimes people need another start, and recognise that sometimes the ending of a marriage may prepare the way for new life better than staying in something that is not working, abusive and painful. And we do so in Jesus’s name believing that we are following him in sharing compassion and love in the world, notwithstanding these few verses of Mark chapter 10. I believe that the Jesus who said, “Let the little children come to me; do not stop them; for it is to such as these that the kingdom of God belongs. “ would do the same if he lived in our day. I’ll probably never convince the fundamentalists. But then you never can. Last week’s gospel included the line that if your eye sins you should pluck it out. Cedric nudged me in the ribs and pointed at the preacher and said, “but he’s got two eyes, why should we listen to a word he says”. My response to that gospel is always the same- Never trust a two-eyed fundamentalist. And maybe that can shine a light on Jesus’s words that we hear today. Maybe the same sense of Hebraic hyperbole is going on. If you get married, stay married he says and does so with a force that seems downright unreasonable now but in his day was part of the daily rhetoric. But then he says, “oh, and let all the little ones come unto me”. I know where I hear most the God of Love in today’s the gospel as I read it in our times. Our identity in the world will be found when we can do the same.